ABOUT 10 YEARS AGO, at the International Fly Tackle Dealer trade show there were over 15 different eyewear companies—meaning polarized sunglass makers—exhibiting. This year, there were only a handful that bothered to come and show an interest in the fly fishing market. From many of those companies that were going to “rock the world” of fly fishing three years ago… well, all we hear now are crickets chirping. Granted, they’re still making polarized shades that cut through the glare on water, just fine. But if you look at the now-thinned herd, it comes back to a few companies who have been standing with fly fishing all along, as well as some newbies with some interesting new designs for 2012. That starts with Smith Optics, and Costa Del Mar. 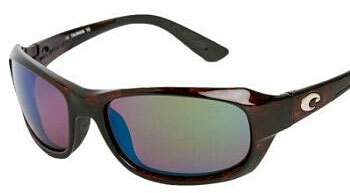 Most of the guides we work with wear Smith or Costa shades. And it’s purely a matter of personal preference (and marketing influence) whether they lean toward Smith “Techlite” glass, or Costa “580” glass. But in terms of optical clarity in fly fishing, it is a glass world, and these are the two dominant players. For 2012, both companies have launched a number of new frame styles. What fits your head, and what you think makes the best fashion statement, is, of course, purely up to you. And the tint that works best, from the copper and amber, to gray or yellow, depends entirely on the fishing scenario you’re in. For the record, Smith took top new product honors at the International Fly Tackle Dealer show for its new “Chief” style. Costa has also come out with a number of intriguing variations and styles for 2012. And both companies also offer polycarbon (plastic) lenses that offer their own advantages, namely lower initial price, more shatter resistance, and so forth. Flying Fisherman has also been a long-time industry player, and they own that market of anglers who don’t feel like spending more than $100 for eyewear. New for 2012 from Flying Fisherman is the St. Croix series, which sells for $69.95. Ono’s is another market stalwart, and it’s come out with an Ernest Hemingway series ($139.99) for 2012, as well as some top-mounted bifocals (Top Focal $139.99), which makes perfect sense. Having worn bifocals for a few years now, the problem with bottom magnifiers is that you stumble on the rocks when you look through a blur at your feet as you walk. ASG and Flex Spex are also out with new options in the eyewear category. And Kaenon has some new models worth checking out. It wouldn’t be wrong to say that any sunglass company that makes polarized lenses (basically all of them) is a viable player in the fly fishing market, but we’ll start with the companies that are marketing hard to anglers, and build out our review repertoire in the coming weeks.